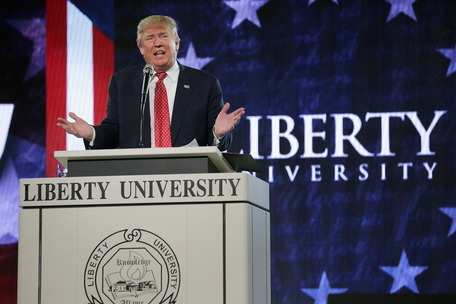 Donald Trump was invited to speak at Liberty University in January. Jerry Falwell, Jr., the school's president and son of the famed evangelical leader who founded the Moral Majority, is a staunch Trump supporter. Hypocrisy and politics have gone hand in hand since time immemorial. But the embrace of Trump by influential religious conservatives — who have always insisted that they, like Hebrew National, answer to a higher authority — is orders of magnitude worse than the customary flip-flopping and sail-trimming of a presidential campaign. Far from leading the opposition to the GOP's grotesque nominee, Reed chairs his religious advisory board. Nothing in Trump's long record of lecherous and disreputable behavior has shaken Reed's support — not even the video in which he boasts explicitly of groping women. "People of faith" have more important concerns, Reed told CNN on Monday. "I think a 10-year-old tape of a private conversation with a TV talk show host ranks pretty low on their hierarchy of concerns." Falwell died in 2007, but his son — Jerry Falwell Jr., the current president of Liberty University — fulsomely endorsed Trump in January. "Donald Trump lives a life of loving and helping others as Jesus taught," Falwell the Younger gushed. He, too, sees no reason to walk back his blessing. Christian conservatives had no patience for such rationalizations when they were invoked to defend Bill Clinton. William Bennett — a serious Catholic, public intellectual, and Reagan-era Cabinet secretary — published a book in 1998 debunking the arguments made then by Clinton's supporters, and now by Trump's. 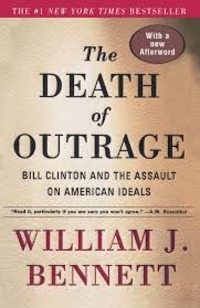 In a 1998 bestseller, "The Death of Outrage," conservative thinker William Bennett demolished the arguments made by Bill Clinton's supporters during the Monica Lewinsky scandal. But Bennett today applies a different standard to Donald Trump. The Gospel's injunction to "judge not, lest ye be judged" is a warning against hypocrisy and self-righteousness, he wrote. "It is not — it cannot be — a call to withhold all judgment or never to express a critical opinion of another." After all, both Old and New Testaments repeatedly condemn immoral behavior. Christians are not called upon to overlook sin, Bennett pointed out, but to resist it. There is nothing admirable about refusing to "make reasonable judgments based on moral principles" — particularly in weighing the actions of democratic leaders.